This removable hard drive hot-swap bay makes it easy to swap 3.5â€ SATA or SAS drives in and out of your server or desktop computer, using an available 5.25â€ front drive bay. It features a trayless design that saves you installation time and enables you to insert or remove drives as needed. 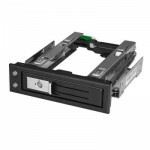 With its durable plastic and aluminum construction, it provides a cost-effective solution for drive maintenance and interchangeability of data between multiple systems. With support for both SATA and SAS 3.5â€ drives, it saves valuable time in environments where storage drives need to be replaced or removed regularly, such as in server rooms and data centers. Its cost-effective design makes it ideal for large deployments of system builds or upgrades, and for organizations intent on maximizing their IT budget spend.